Tree partly from Kukalová-Peck and Lawrence (1993). 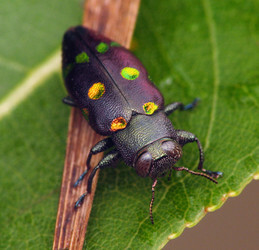 The suborder Polyphaga contains the majority of beetles, with about 300,000 described species. 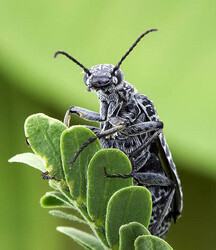 Among the commonly encountered polyphagans are the rove beetles (Staphylinoidea), scarabs and stag beetles (Scarabaeoidea), metallic wood-boring beetles (Buprestoidea), click beetles and fireflies (Elateroidea), as well as fungus beetles, grain beetles, ladybird beetles, darkling beetles, blister beetles, longhorn beetles, leaf beetles, and weevils (all Cucujiformia). Aquatic lineages have evolved several times within Polyphaga. The largest groups are found within Hydrophiloidea and Byrrhoidea. Polyphagan beetles do not have the pleuron of the prothorax externally visible; instead, remnants of the propleuron are present internally as a "cryptopleuron" (Hlavac 1972, 1975; Lawrence and Newton, 1982). Because the lack of the pleuron in the external body wall, at most one suture (that between the notum and the sternum) is visible in the prothorax in polyphagans. In members of other suborders, two sutures (the sternopleural and notopleural) are often externally visible (unless secondary fusion between the sclerites obfuscates the sutures, as in the case of Micromalthus). 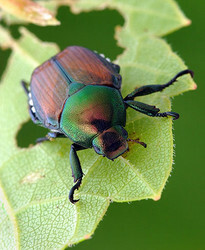 Female polyphagan beetles have telotrophic ovarioles, a derived condition within beetles. Caterino, M. S., T. Hunt and A. P. Vogler. 2005. On the constitution and phylogeny of Staphyliniformia (Insecta: Coleoptera). Molecular Phylogenetics and Evolution 34(3):655-672. Kukalov?-Peck, J. and J.F. Lawrence. 1993. Evolution of the hind wing in Coleoptera. The Canadian Entomologist, 125:181-258. Page: Tree of Life Polyphaga. The TEXT of this page is licensed under the Creative Commons Attribution License - Version 3.0. Note that images and other media featured on this page are each governed by their own license, and they may or may not be available for reuse. Click on an image or a media link to access the media data window, which provides the relevant licensing information. For the general terms and conditions of ToL material reuse and redistribution, please see the Tree of Life Copyright Policies.